Remember those little triangles on your radio dial? The triangles were the civil defense mark. 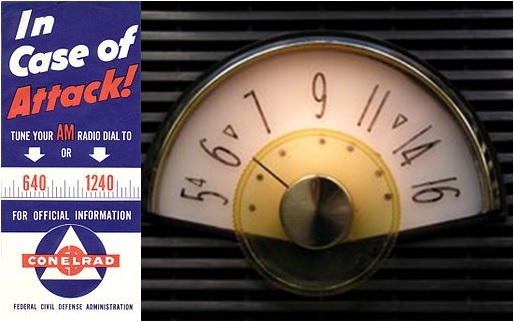 Between 1951-1963, all AM radios sold in North America needed to be CONELRAD system compliant and part of the emergency broadcasting system. Here’s why and how. World War II taught us to fear air raids. Pearl Harbor and other attacks taught us that enemy aircraft could use broadcast signals to home in on targets. (Ironically, the US Air Force actually paid Honolulu AM stations to remain on the air at night.) The Cold War taught us to fear nuclear attack. Put these ideas together and you end up with the CONELRAD system or “planned confusion”. So, in the early 1950’s, many people were concerned about nuclear attack, particularly strategic bombers coming over the North Pole. The United States, Canada, Cuba and Mexico developed a system to use radio broadcasting for emergency information and confusing direction finding. This was called CONELRAD – which stood for “Control of Electromagnetic Radiation” – with two goals. First, provide public information. In the event attack, leaders saw radio as the major communications medium with their citizens, just as in World War II. All radio broadcasting would operate on two frequencies – 640 and 1240 kHz. Listeners would tune to these channels for instant and continuous information and instructions. Second, confusing direction finding. Regional clusters of stations would take turns broadcasting on these frequencies, switching regularly. As a result, the enemy would not be able to home in on transmitters because they kept moving around. Typically, each station in the cluster would turn on, broadcast for 5 to 40 seconds, and then turn off, with a different station taking over. The cycle would last from 3-6 minutes. Programming was done over phone lines, so it remained the same no matter which station was switched on. Power had to be reduced and often pulsed. More than 1200 AM radio stations signed up for the scheme. They made investments for transmitter control and synchronization. Stations which did not sign up, and all FM/TV broadcasters, had to leave the air for the duration of the emergency. Here is a detailed documentary on how the CONELRAD system was supposed to work. By 1963, the threat had shifted from bombers to missiles with advanced guidance systems, and the scheme was discontinued. CONELRAD System – Did It Work? On paper, perhaps. In reality? Fortunately, we never found out. During exercises and tests, not so much. Broadcasting’s state of the art at the time was a real challenge. CONELRAD required remote control which was quite meager, although its use was stimulated during the era. Frequency and antenna switching was even more of a stretch. Transmitters of the day were not designed for rapid switching on and off. They tended to fail under the stress. Antennas were (and still are) single frequency designs. Telephone lines for sharing programming and sending tone signals for coordination were up to the task, at least before an attack. During tests in 1953, the clusters did not provide reliable coverage for listeners, particularly on 1240 kHz. However, there was some success in confusing 20 bombers trying to home in on test targets. The system relied on key stations to monitor telephone lines for alerts. All other radio stations required special receivers to listen for warning tones. By the way, ham radio operators also had to monitor CONELRAD and stop transmitting when warned. Ahhh…The good old days. I have an old Hallicrafters shortwave radio that has the triangles on the dial. Thank you for the memories. Thanks, Ed. When writing the article, I looked around the house to see if I had any Conelrad radios remaining, but no luck. I guess I have been too thorough with the spring cleanings!